It's time for another ISC Challenge! For this challenge you need alter something using any ISC images. Here I altered a Jewel Case into a Calendar Holder. These jewel cases are available while supplies last here on the ISC site. I used the Red Castle Calendar program to create my calendar. My main image is stamped in black on vanilla card stock, then I added my Ranger Distress inks with the blending tool, to created the Burnt Edges Look. Would you like to play along with this weeks ISC Challenge and have a chance to win some FREE stuff? 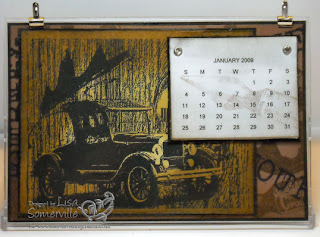 Simple - just create altered project using ISC images, and leave a link the ISC Blog for your chance to win a 2 calendar jewel cases and any stamp sheet of your choice. If you are loading to SCS - please use keyword ISCC15 so we can all see you work - but just a reminder you still need to leave a link on the ISC Blog. You have until October 19, to enter. Good Luck!